I've already made up some little stories in my head about the adventures of Hedgie, Woolie the Sheep and their flock of chicks. 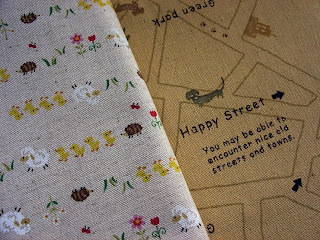 The Happy Street Fabric is destined to become Passport Wallets, because isn't Happy Street what we're looking for when we're traveling? I got these fabrics from Super Buzzy, one of my favorite on-line fabric sources. They are having a big Spring Cleaning Sale that I found out from my new favorite site, True Up. True Up is all about fabric. It highlights manufacturers, designers, self-printing options and sales. I love indulging my fabric geekiness there, although my PayPal account has felt its effects! P.S. Some of my things got a little blog action! My Owls of Athena Passport Wallet got a mention at Blue Orchid Design, and my Retro Blue Dots Brooch Clusters made it into a terrific collection of retro items at smashingmagazine.com. Yay! I found your blog the other day and like so many others, have fallen in love with your passport wallet. I have the templates now but can't find the directions. Adorn magazine doesn't seem to exist any longer and though I've searched online, I don't see any where else that they are available. Do you happen to know where I can find the directions? I would so much appreciate the information so that I can make my future daughter-in-law a wallet to use on her honeymoon to Italy this spring. Your ideas and craftmanship are so wonderful!